Known for his dazzling remixes for Charli XCX, Death Cab For Cutie, and more, Japanese Wallpaper adds a bright and energetic touch to Broods’ soulful new single. The original version of “Too Proud” is from the band’s latest album, Don’t Feed The Pop Monster, released last month. “Too Proud” is a standout track from the new album that address the stigma of mental health, especially among men, straight on and is the first Broods track to feature Caleb on lead vocals. Following album release, Complex praised Broods for delivering “something both personal and authentic.” Broods also shared the poignant video for “Too Proud” and appeared on The Late Late Show with James Corden to perform the new single. View the band’s Late Late Show performance here and the official music video for the single here. Don’t Feed The Pop Monster is the band’s follow up to their sophomore record, Conscious, which they released in June 2016. Broods had their breakthrough with the 2014 single “Bridges” from their full-length debut Evergreen. 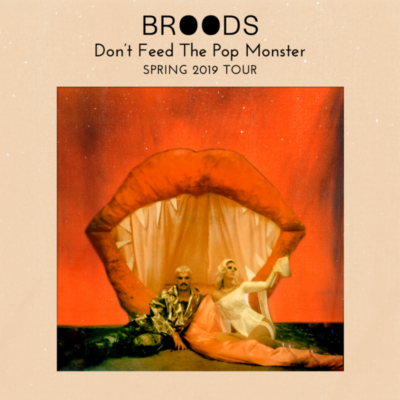 Broods have played leading festivals like Coachella, Lollapalooza and Outside Lands and shared stages with artists like Ellie Goulding, Haim, Sam Smith, CHVRCHES, and most recently, Taylor Swif.